Ryanair are having a great sale where you can fly across Europe from only £4 / €4 one-way. 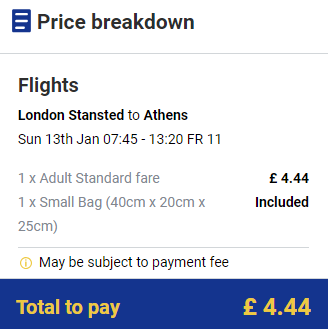 For example, fly from London, UK to Athens, Greece for only £4 one-way (see image below). However, do NOT purchase on the Ryanair website. Simply find the cheap dates, then purchase on the Skyscanner GO TO DEAL button below.